Photo source: Copyright © International Mission Board-SBC - Jacob Talley. Used with permission. The Minangkabau (also called the Minang) come from West Sumatra Province and are the majority ethnic group in all areas of the province other than in the islands inhabited by the Mentawai people. They speak the Minang language, which has many dialects. They are famous for their tradition of leaving their home village and working in other areas to find their fortune. Many of them have moved to other regions of Indonesia. They are the fourth largest ethnic group in Indonesia and have a great deal of influence. The very name Minangkabau witnesses to a high degree of wit. Literally the name is said to mean "winning" (menang) "water buffalo" (kabau or kerbau). It supposedly reflects an ancient contest that was used to determine the outcome of a war. The Javanese "champion" was a huge buffalo, while the Minangkabau chose an unweaned calf. After starving the calf before the fight, they tied a knife to its snout. When the animals met, the hunger-crazed Minangkabau calf tried to nurse, causing the Javanese beast to bleed to death. Today, the water buffalo figures prominently in Minangkabau myth, culture and architecture. Traditional Minangkabau homes have roof eaves that soar outwards like the horns of the buffalo. In the past, Minangkabau villages were small and led by a chief and his advisors. Every village had autonomy. Kings and nobles were not allowed to interfere. Other than owning restaurants, Minangkabau also are famous as traders. They deal primarily in clothing and jewlery The Minangkabau are very proud of their traditions. In their matrilineal culture, the family name and the family wealth is inherited by the daughter. In the house, much of the responsibilities are held by the wife's brother, called ninik mamak. This uncle is required to take care of his nephews and nieces and watch over everything connected to the family heirlooms and inheiritance. The role of the uncle is decreasing these days as more Minangkabau change to the more common way of life of the husband leading the house. This change is primarily seen in Minangkabau who have moved out of the Minangkabau areas to find their fortune. The Minangkabau are famous nationwide for their cuisine. They have restaurants literally all over country. They are also famous as traders. They deal primarily in clothing and jewlery. 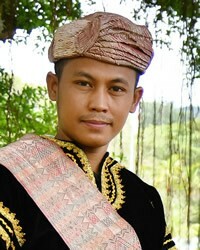 Most Minangkabau are orthodox Muslims. There is a Minangkabau saying, "To be Minangkabau is to be Muslim". The Minangkabau who leave Islam are disowned by their family and neighborhood and lose their job. In the 1800s, the Dutch took advantage of a conflict between the guardians of Minangkabau traditions and the Muslim religious leaders to increase their power in the area. Once the religious leaders united with the traditional elders to oppose the Dutch, Islam was added to the Minangkabau traditions. 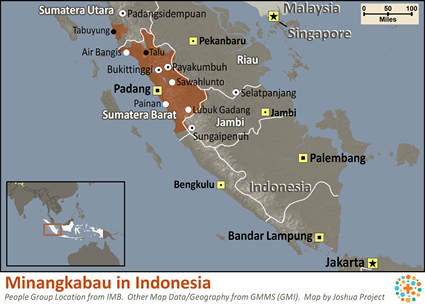 In education and business, the Minangkabau are relatively better off than other ethnic groups in Indonesia. Nevertheless, education and industry in West Sumatra still need improvement. Home industries are mainly weaving, sewing and knitting. These crafts have the potential to be increased. Tourism is the only other industry that could be developed in the Mentawai islands and the areas of Lake Maninjau, Lake Singkrak and Bukittinggi. View Minangkabau in all countries.